On my worktable I have two novels. Open each and you’ll see line breaks, ragged margins, the form of poetry. But after reading both I wonder, are they truly in verse? Does the poetic form fit both novels equally well in terms of voice, use of language, and creation of vivid moments? Is the poetic form necessary for both books, and if not, why? The first novel you’ll find on my worktable is Out of the Dust by Karen Hesse. The second is True Believer by Virginia Euwer Wolff. 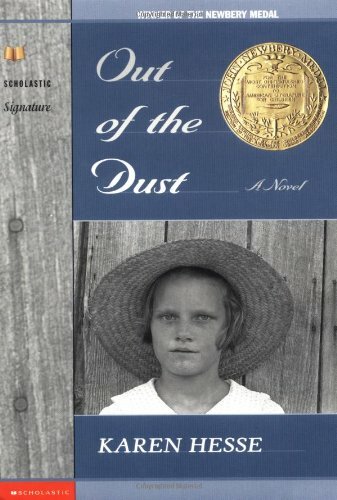 Hesse takes Billie Jo through the dust bowl of the 1930s while Wolff tells LaVaughn’s story of surviving poverty in a contemporary urban landscape. One of these books is a stunning example of a novel in verse; the other may not be in verse at all. Her words are as casual as her character, dated to the historical time period with darn and fine face, and they create a vivid sense of place—after all, Mad Dog is a plowboy. Moreover, there’s the lyrical quality of her words, the rhythm and alliteration of fine face and assonance of smooth voice, not only poetic but fitting entirely with Billie Jo’s love of rhythm and music. Note, too, a fine contrast between Billie Jo’s cursing of Mad Dog and her obvious envy and attraction—beautifully stated and beautifully real for any thirteen-year-old girl. Daddy uses language fit for the times, in a clover, while details like the extravagance of chocolate milk for dinner add to the historical authenticity. Both of these also give Daddy his own voice, distinct from Billie Jo, while the syntax in the final line is uniquely her own. The voice in Wolff’s True Believer is less vivid, less convincing. The following excerpt catches LaVaughn reflecting on the changes in her social group: her friends have joined the “cross your legs for Jesus” club, and an old acquaintance has moved back to the neighborhood. and watch Myrtle grow up and finish school. For an urban teen this both works and doesn’t work. The words themselves could, I suppose, be a teen of little education from the inner city. I’d expect a lot more edge to the voice, more urban slang or syntax, but I could be convinced LaVaughn is really writing this. Yet I’m not at all convinced she’s writing this. For the simplicity of her thoughts, the form in which they’re presented is far, far beyond her level of sophistication. A girl who “sort of” believes in a “sort of God,” a girl who has never read a Psalm, let alone a sonnet, would not write in verse. I don’t buy it for an instant. And take LaVaughn’s discussion of her aunts deeper into the story. Here I’m unconvinced both in words and form. because they are old and they are ours. LaVaughn’s thoughts do not seem like her own—they’re too reflective, with an adult sentimentality. It’s possible she’s heard about the Great Depression on Oprah, or her mother has spoken of it and her aunts and LaVaughn is merely regurgitating words from this other source. That I would believe. But neither of those options are given, so I’m left that LaVaughn can express a thought like, “they had their childhood in that awful time,” which hints at tenderness and empathy, not to mention an understanding of history that just doesn’t sync with LaVaughn’s emotional, verbal or educational development to this point. The voice in True Believer does not mesh with the poetic form, and in some places it simply doesn’t mesh. The language in True Believer does take a few rare poetic turns. At one point LaVaughn visits the pool in a wealthy part of town: “That pool is a dream [...]/and hanging plants in the corners,/soaking up the steam and growing immense/with their privileged lives" (204). The imagery is concrete, vivid, and the words themselves have internal music. Privileged lives, too, hints at personification. Likewise, a bit farther on LaVaughn describes the “groggy dark of the morning” (245), and shortly before, “(I felt like a parentheses./Everything going on in the world/outside me” (243). These creative and poetic uses of language almost make me believe in the poetic form of the book—i.e., that LaVaughn really might have written, spoken, thought with this sort of depth of insight and creativity. Unfortunately, I find it’s too little, too late. slow tracks of wet dust down the bulge of her belly. This imagery follows an accidental fire, the fever and death of her mother, the brutal wind and dust and dry heat of summer ... it’s hard to imagine the beauty and meaning of this snow following all Billie Jo's loss could be expressed in plain prose. The next stanza concludes with a simple two lines, “I wish I could see poppies/growing out of this dust.” Another moment, vivid and stirring. Could plain prose serve Hesse’s text as effectively? While the dust blew down our road, against our house, across our fields, up in Canada a lady named Elzire Dionne gave birth to five baby girls all at once. I looked at Ma, so pregnant with one baby. “Can you imagine five?” I said. so pregnant with one baby. “Can you imagine five?” I said. Ma lowered herself into a chair. just to think of it. The poignancy is present in both, but is far stronger in the poetic version. The poetic form slows reading and thought, develops those single words into full ideas. Hesse’s novel depends on the form, the line breaks adding to the meaning of the words. Every one of Hesse’s poems is its own moment. A chain of moments, the form of free verse connecting them, the form essential to the success and beauty of each poem individually and to the whole. If Dr. Rose had not been sick in bed that day. and gone to the club meeting. If we had been out of chocolate chips. to grate into the cookie dough. And here is a bit more, in a standard paragraph (punctuation added). It started when Jody’s mom came up from their place way before daylight. She had his homework in her hand; he couldn’t be late with it and lose points. He needs all the points he can get for the swimming scholarship. She wanted me to take his homework to two separate teachers and I said I would. Jody’s real sick, she said, fever and everything, he can’t go to school today. It’s just a bad cold, but still. Jody’s invisible handprints were on his math. I stroked the pages with my fingers in the groggy dark of the morning. I see no clear difference between the two forms. If anything, the standard paragraphing makes the story quicker to read, easier to follow, more enjoyable. The narrator’s voice doesn’t have to be poetic or artistic or particularly any one thing or another to get the story told. In the previous form, the poetic form, there are certain expectations for LaVaughn’s character that, as shown earlier, aren’t met. In my view, the form of poetry in True Believer is perhaps working at cross purposes to the story itself. Wolff said in an interview that she did not intend her novel to be "verse," yet the writing community considers it verse and uses it as a model. So intentionally or not, Wolff and Hesse use the same form for their stories, but I would suggest that only one of them is truly “in verse.” The other mimics poetry by putting line breaks into prose that do little (if anything) to enhance meaning. Yet Wolff's novel is praised for how effortlessly it reaches its audience. Because of the short lines, the white space, the book is accessible to young people who might not ordinarily confront a book like Wolff's, or any book for that matter. I wonder if something like Accessible novel might be a better term than Verse? What does Verse actually mean? What do you think? What defines a novel in verse anyway? *All page references refer to the large print edition, which was the only copy my library had on hand when I went looking. 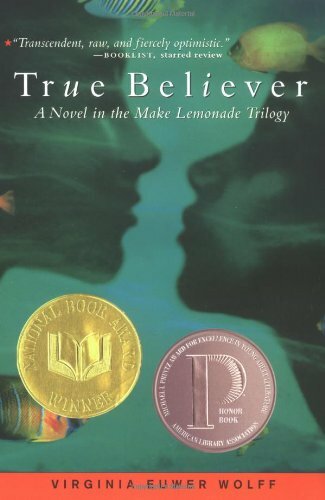 True Believer is a novel in verse, or is it? I would say funky line breaks and jaggy right margins do not verse make (how’s that for some ferociously f*rked syntax?). On my worktable I have two novels. Open each and you’ll see line breaks, ragged margins, the form of poetry. But after reading both I wonder, are they truly in verse? Does the poetic form fit both novels equally well in terms of voice, use of language, and creation of vivid moments? Is the poetic form necessary for both books, and if not, why?